Whether you’re a big international brand with bases around the world, or a start-up that’s just spreading its wings, making sure your offices look and feel consistent is an important consideration. Not only is your office your company’s shopfront when clients visit, it’s also a vital way of building brand awareness, morale and motivation internally. If everyone across the business can relate to each other’s surroundings, they’re more likely to feel like one team. On a more practical note, it can also lead to savings when it comes to buying office equipment and furniture. Since 2015, we’ve been working with Skechers to build create on-brand environments in the Netherlands, Switzerland, Spain and most recently, the UK. So here are our top tips for keeping things consistent. However big or small the company, you need to find elements of the brand that can be translated into your office design, so make yourself familiar with every aspect. From colours and typefaces to logos and photography styles, anything can inspire you, just remember that less is more. So instead of smothering everything in brand colours and logos, pick elements that can be subtly woven into the design. 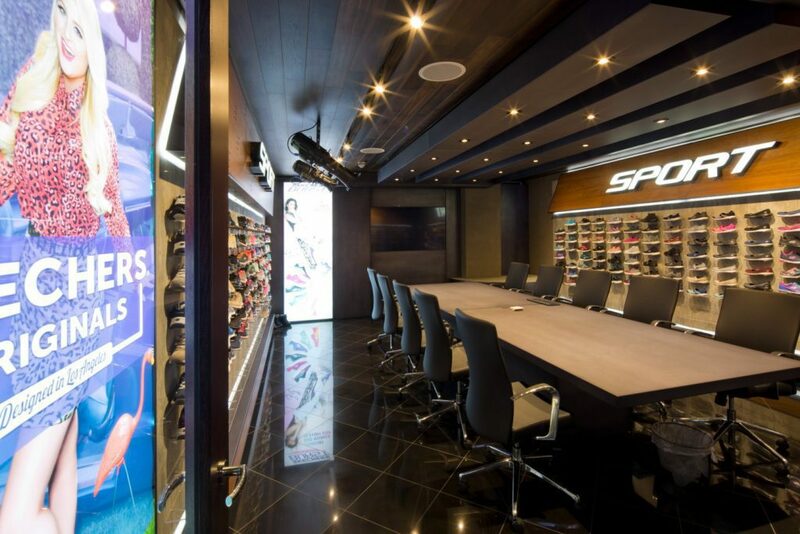 For Skechers, that meant keeping the main areas of the office understated, and using meeting rooms to bring the brand to life. As the one place that every colleague and visitor will pass through, getting reception right is key. It’s your chance to make a statement and crack the all-important first impression. 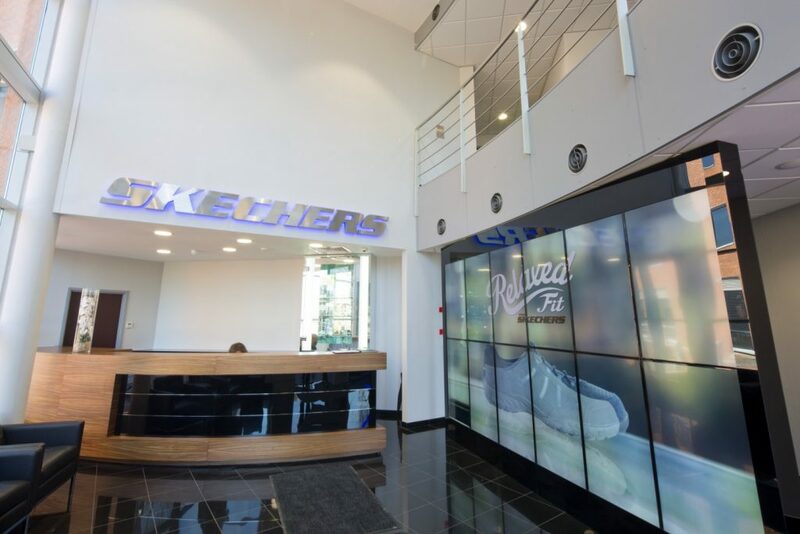 Visitors to Skechers’ St Alban’s office are met by a bold 3D brand mark and screens showing the latest ad campaigns. As well as entertainment while you wait, it also helps build brand awareness with everyone who passes through. Don’t be shy about showing off what you do. Whether it’s a physical product, inspirational shots of a new service or artwork from a recent campaign, let your work do the talking. For Skechers, this meant bold displays of their distinctive footwear in key meeting rooms. In areas where a lighter touch was needed, campaign creative was displayed in print and on screens. Although consistency is key, it shouldn’t be at the expense of comfort or productivity. What works in one office simply might not fit in another, and even between teams some variation might be needed. For instance, a design team might benefit from quirky break-out areas, while those in finance might prefer more comfortable, functional office furniture. The key here is asking for (and listening to) feedback from the floor. At Skechers, we created both open-plan areas and partitioned offices so everyone could find their perfect space. It’s often the small details that jar if they’re not quite right, so make sure everything from fonts and colours to icons and imagery are consistent on office signage – from meeting room signs to toilet symbols. That way, colleagues and clients will feel at home in any of your offices.